GMA is a forum of management professionals in Goaand is involved in furthering management knowledge, promoting and developing management talent and professionals in the region. GMA provides a forum for managers for interchange of knowledge, experience and ideas at various management development programmes, lectures and annual day function. GMA was founded on 5 June 1975. During the 70s, entrepreneurs in Goa felt the need to set up a management association, which could promote debate in the body of management knowledge and provide professional training to managers and promote scientific management. The credit for initiating the process of establishing GMA goes to the late Mr. Vasudeva V Dempo, Chairman of Dempo Group of Companies and Mr. Ashok V Chowgule, Director of Chowgule Group of Companies. All the major contemporary enterprises of that time participated wholeheartedly in this venture and gave the much-needed impetus to this initiative. For the past four decades, in this objective, GMA has been conducting programmes, events, training, seminars, etc. and liaises with local bodies, professionals and other similar forums. 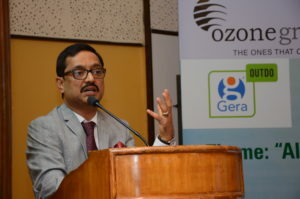 GMA has an aggregate membership of 305 members, which includes organisations and management professionals from different industry sectors, across the Goan industry landscape. It currently has 52 institutional members (represented by 120 nominees) and 185 individual members. Over the recent few years, GMA has actively engaged with the management education fraternity, including management students and teachers, at both undergraduate and post graduate level in Goa, to partner and promote excellence in management thought in Goa. Every year in September, GMA holds its Annual General Meeting, and as a part of this event, also conducts its Annual Lecture. As a part of the Annual Day celebrations, GMA invites eminent personalities to address its members on a relevant contemporary issue in management. GMA has had the honour of the presence of eminent senior personalities, who have been the Chief Guest and delivered the annual lecture in previous years. Few of the luminaries who have addressed GMA at the Annual Day are Prof. Bibek Debroy, India Economist, Professor – Centre for Policy Research, Dr. Ajit Ranade – Chief Economist, Aditya Birla Group, Mr. Bhaskar Bhat – Managing Director, Titan Industries Ltd, Mr. Kuldip Kaura, CEO, Vedanta Group Plc, Mr. Prakash Apte, President & Managing Director, Syngenta India Ltd , Mr. Raman Mangalorkar, Head – Consumer Industries and Retail Practice, South Asia, A T Kearney Ltd , Mr. T V Mohandas Pai – Member of Board and Director, Human Resources, Education & Research and Administration, of Infoys Technologies Ltd, Mr. Anant J Talaulicar – Managing Director, Cummins India Ltd, Mr Praveen P. Kadlé – Executive Director, Finance and Corporate Affairs, Tata Motors Ltd, Mr Alok Tyagi, Head – Strategy n Business Development – Tata Chemicals Ltd and Mr Azim Premji, Chairman of Wipro Corporation. GMA has been conducting various Management Development & Training Programmes since its inception. Since January 2005, GMA has been also conducting Knowledge Lecture series. In order to promote and recognise managerial talent, GMA has constituted Management Awards, which are given in four categories; Manager of the Year, Young Manager of the Year, Best Management Student and Management Student Commendation Award. These awards are presented to winners at the Annual Day function. The present President of Goa Management Association is Mr. Nitin Kunkolienkar.